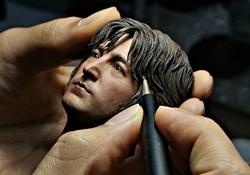 Soon you'll be able to buy a 1:6 scale doll of John Lennon, if you're into that kinda thing . Beatles Radio: The Beatles, Solos, Covers, Birthdays, News The Fab 4 and More! Somewhere along the line, over the course of a half dozen or so moves, I mysteriously lost my 20-inch-tall cloth John Lennon doll. Granted, the level of detail wasn’t particularly good: I would place it halfway between the Saturday morning Beatles cartoon and Casper the Friendly Ghost. But it was still recognizably John Lennon, thanks in large part to the inclusion of a plastic Rickenbacker guitar, as well as the fact that very few musicians reach that level of mass-produced stuffed effigy. In fact, those late-’80s “Beatles Forever” dolls were the only rock ‘n’ roll collectibles offered by Applause, a since-bankrupted novelty company that was better known for its tricycle-riding Curious George and a line of unremarkable Muppet dolls.